Nebraska City, one of the state’s most historic communities, was considered an “ideal site for a future city” by Lewis and Clark. A ferryboat crossing remained in operation after the early Ft. Kearny moved westward in 1848, establishing the site as a major river crossing during the Gold Rush. In 1854, with the opening of the settlement of the Nebraska Territory, the old fort formed the nucleus for a new city. Nebraska City was identified with environmental stewardship long before it became popular elsewhere. J. Sterling Morton, one of the state’s leading political figures, established tree-planting as part of the regional ethos. 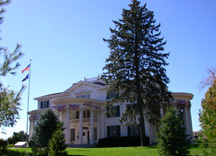 His home, Arbor Lodge, originally built in 1855, became the center of a personal arboretum and led to his founding of Arbor Day. Copyright 2011 & 2012, Stephen Hassler, all rights reserved.